It is Tablet & Laptop (2-in-1). It is Ultra Slim and Powerful for up to 18 Hours of Mobile Productivity. It has Tegra 3 Quad Core, which is Power full for Multimedia Enjoyment. It is 8.3 mm slim and 586 light. It has Ultra bright Super IPS + Panel with 178 wide Viewing angles. Its Camera is 8MP rear auto- focus with Flash. 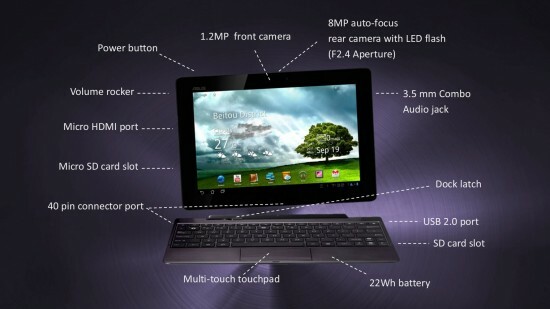 Asus Eee Pad Transformer Prime Reproduced the Crystal Pure sound and its Key board dock with USB/SD Card Reader. 32 GB + 8GB life time with Wi-fi and 1 Year Warranty. You may also New Samsung Galaxy Tablet and New Apple iPad Prices at Saudi Prices Blog.